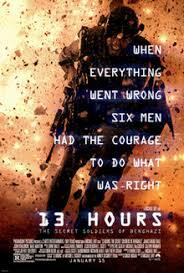 I was not looking forward to this movie, I am not a Michael Bay fan. But this was only produced by him, so his over the top action and loud explosions didn't dominate the screen. I was also pleased this was not a Right Wing rant but more of a focus on the people who were in the center of that conflict and deserve to be remembered.